As the complexity of wireless, broadband and enterprise networks continues to grow, you rely on your knowledge and expertise to stay productive, profitable and prepared. 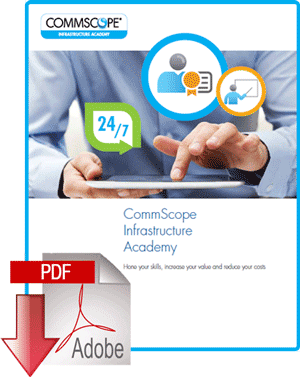 The CommScope Infrastructure Academy supplies the training you need through a flexible online program that fits your busy schedule. Whether you are a network installer, technician, engineer or integrator, the CommScope Infrastructure Academy has a comprehensive selection of courses that provide in-depth training on today’s advanced wireless, broadband and enterprise solutions. As well as courses on twisted pair, fiber optic, coax and wireless infrastructure technology, students have the opportunity to choose a variety of specialist courses from DataCenters to Intelligent Buildings, Wireless to Broadband, Cellular to Backhaul, Enterprise Campus to Outside Plant. The CommScope Infrastructure Academy makes training flexible and convenient using your laptop, tablet and even your smartphone. The CommScope Infrastructure Academy forms the educational foundation for CommScope’s global PartnerPRO™ Network. Since its inception, the academy has provided the training that enables network members to keep their skills razor-sharp and deliver the consistent value their customers expect.